Also referred to as motor coaches or motorhomes, luxury RVs are some of the most fêted extravagances today. Typically, these vehicles offer you the luxury of having a kitchen, bathroom and all other necessary house amenities on the road, thereby ensuring you get a true ��home away from home’ experience. In the last few years, the world has seen a rise in demand of the RVs with several superstars and celebrities such as Will Smith taking the lead to acquire one for themselves. You could be the next in line to own one of these extravagant motor coaches yourself. Before then though…have a look at the following list of the top 10 most expensive luxury RVs on the market today. This elegant luxury RV comes with a cab-forward design that includes a SmartWheel integrated steering and eight-way power seats. This makes your ride very comfortable and fun. You will also enjoy the advanced Mobileye as well as the touchscreen technology fitted in this vehicle. Its interior features a master suite, an impressive entertainment system, and sound bar. Other amenities included are a walk-in shower and a heated porcelain floor among others. This is certainly a bargain considering its fair price. Making the cut to the list of top 10 most expensive luxury RVs today, this vehicle was built by the renowned luxury RV firm Country Coach. This vehicle is powered by the powerful 600HP Cummins diesel engine. The bus-converted RV can effortlessly climb over mountains thanks to its telescope wheels and power tilt. It has an impressive interior that features earth stones and walnut cabinets, queen sized beds and a tiled entry step among others. It also comes fixed with solar panels to ensure there is no shortage of power while adventuring. At a quick glance, you will be deceived by what you see from the outside of this luxury RV. However, a close look at its interior will prove to you how luxurious this ride can be. It’s perhaps the most rugged luxury RV on the market today. However, with a 2,000-mile gas tank and solar panels to service your power, this vehicle will ensure you travel for the longest distance without the need to stop over at refueling points. It comes with a master suite, a kitchen, and even a water maker that helps to clean up any contaminated water to make it drinkable. It is a worthy purchase for anyone looking to travel to places with unruly terrain. The 2015 Dynasty is arguably the most ambitious RV that Monaco has produced to date. It comes with a 600HP Cummins engine and a Roadmaster chassis. Its interior is beautifully crafted featuring an LED ceiling, lined cabinets, and a central command center. It also has a master bedroom that comprises a king-sized bed, cedar-lined cabinets, and wardrobes. This RV showcases a rare combination of innovation, luxury, and quality. It is powered by an remarkable 600HP Cummins engine besides being supported by a Spartan K3 chassis. It also features a powerful steering system and a Safety Cruise Collision Avoidance (SCAA) technology to help you navigate through common hazards and bad weather. It also comes with a spacious kitchen area and a residential décor that features elegant sofas, a master bedroom and porcelain floors. This RV is best suited for travelers making trips between urban areas and may not ride over steep or rough terrains. It is elegantly designed, featuring a stainless steel shell to make it one of the most attractive touring machines. It comes fitted with an elegant porcelain tiled flooring, cedar lined walls and cabinets, an impressive master bedroom and an entertainment system. One of the distinguishing features of this RV is the fact that it can be customized to fit the desired design of its owner upon purchase. This includes having a custom built, semi-monocoque chassis that ensures vibrations are distributed through the floor, walls and even the roof. This dampens the harmonics while also ensuring that your journey is quiet and serene. The ride comes with a 20,000 kW generator, and Knoedler air ride pilot seat among other high-end facilities. It also has a hydronic heating system and a Slumber Ease mattress system interior. This luxury RV stands 12 feet 5 inches tall making it one of the most towering converted coaches on the market. Its exterior is created using precision-molded fiber composite to ensure it has a very light body while still retaining maximum strength. Its interior is classily decorated with an stylish wooden floor being the highlight feature. Other features include the curved marble tables, desk space, modern sofas and chairs, spacious kitchen area and a bedroom. It is certainly one of the prettiest luxury RV in the world today. This is another gorgeous motor coach created by Featherlite. It features an impressive interior that consists of a ceiling encircled by sophisticated Swarovski crystals, rare Inca marble, antique bronze, pearlized Italian leather and numerous other expensive decorations and materials. This makes it a real mansion on wheels. The RV comes with a master bedroom with a plasma TV, a king sized bed, a washer and dryer and even a built-in treadmill. Its cockpit has a ultramodern Avic N-2 GPS system that provides you with real-time weather and traffic alerts. You can carry your sports car along fitting it in its garage slide-out compartment on its side body. Its gas tank can hold up to 235 gallons which would cost you roughly $1,000 to fill up. 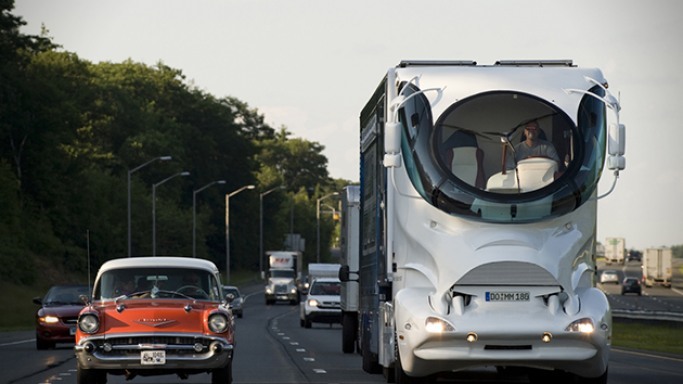 This rolling mansion lies at the helm of our top 10 most expensive luxury RVs list today. This RV includes virtually everything you may be looking for in a posh moving home. Its highlight features include a retractable rooftop, a master bedroom with a bar area, a spacious kitchen and a wireless command center. It features a 510bhp diesel engine and can reach speeds of up to 93mph on an open road. It also features a plush interior that comprises a fireplace and flat screen TVs. This ride will defeat any need for you to spend a night in any luxurious hotel.